Yachts have always been the playthings of the ultra-rich, and some of them are so lavish as to border on ridiculous. 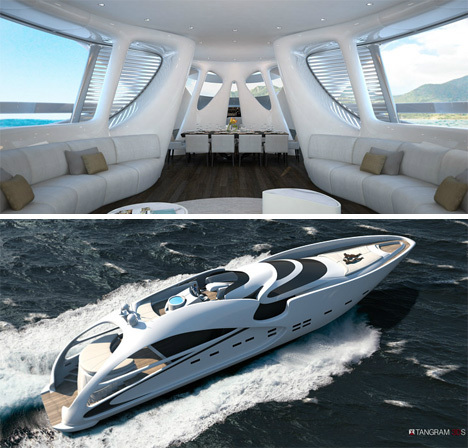 However, just because yachts are perpetually inaccessible to most of the population doesn’t meant that we do not appreciate their unique and graceful designs. So just for a while, pretend you are one of the world’s super-wealthy and take a tour of one company’s incredible yacht offerings. 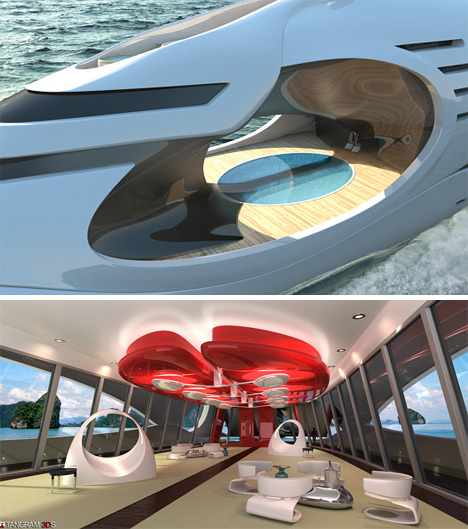 The Oculus, meant to look like a giant fish or marine mammal, is Schopfer Yachts’ first design launch. 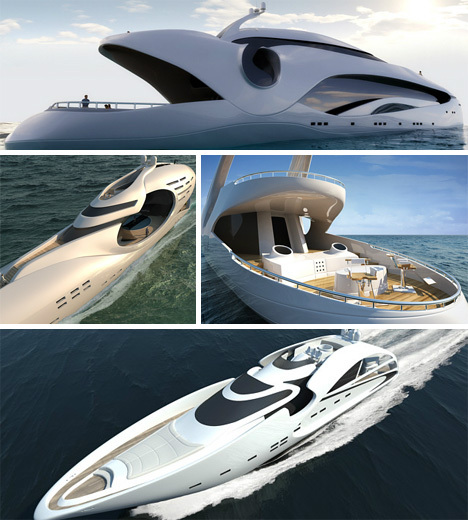 The 250 foot long-distance cruising yacht is meant to accommodate up to 14 people in crazy luxurious style. The company recently announced that they have chosen a naval architect to begin building this monument to sea-faring elegance. With three levels, 12-foot-high ceilings and a dedicated Owner’s Suite, the Oculus is bigger than most homes. Which could come in handy when the tough life of a billionaire gets to be too much and the future owner of this beautiful beast just has to get away from it all. Putting aside for a moment the fact that yachts are luxury items that very few can afford, it is easy to see that they are often the result of fantastic design by skilled craftspeople. 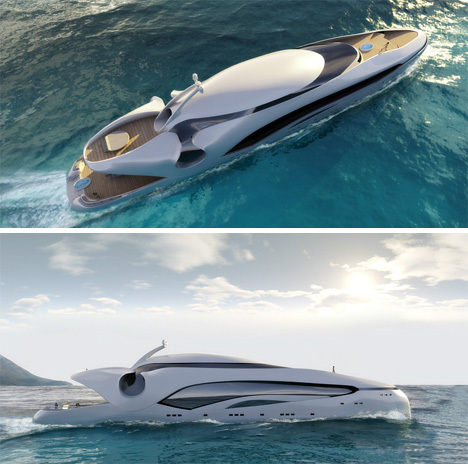 The Infinitas was inspired by the infinity symbol and it is easily one of the most inventive looking yachts ever designed. On of the stand-out features of the Infinitas is the huge pool deck between the lounge and dining room. The pool is bisected by a footbridge which guests can walk across to access either side of the deck; swimmers can glide through the underwater openings in the bridge’s support. Alternately, guests can walk across the glass-floored, glass-roofed sky bridge directly above the pool on their way to the dining room or the helipad. The sleek Audax is a sport fishing vessel whose name translates to “adventure.” The team at Schopfer went out of their way to create a fantastically redesigned version of the typical sport fishing yacht. The redesign allows for much more cabin space, all arranged around a central staircase. The yacht tender and two jet skis have their very own storage areas with their own individual hoists, making it easy to get them into and out of the water. The second yacht in the Audax series continues the trend of sleek, polished, luxury fishing yachts. The second Audax has a wealth of interior space along with cushioned sun lounges and mid-ship access to the flybridge. The shape of the Audax 130 was inspired by the energetic ocean-going flying fish. It features a dedicated “garage” just for the on-board water toys and plenty of space for either fishing or just hanging out and enjoying the sights.